That huge drop-off at the end? 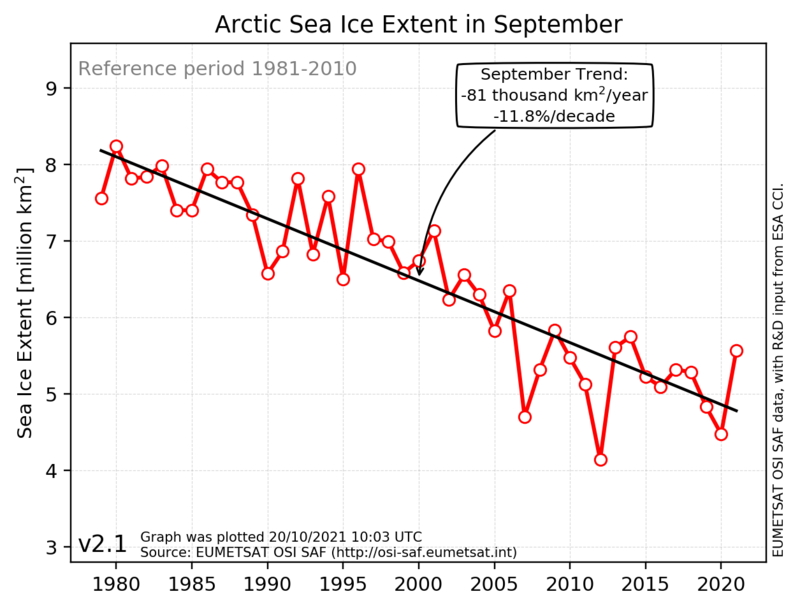 That’s “the largest magnitude decline in sea ice, and the greatest sustained rate in sea ice decline in that 1,500-year record,” said Emily Osborne, the NOAA scientist who compiled the data for the chart. The chart is supposed to show summer sea ice minima, as described here. As we know from DMI, sea ice extent has stabilised in summer, and has slightly increased since 2007. Temperatures recently are no higher than in the 1930s and 40s. The cycle we can see is connected with the AMO. The claim that, the Arctic is warming at twice the rate of the rest of the world, is simply a reflection of the upward part of the cycle. Changes in Arctic temperatures are invariably amplified, either warming faster or cooling faster. The Arctic Report Card comes from NOAA’s Arctic Program, which needs to continue pumping out scary propaganda to keep its funding coming in. Well it was a bit unusual in 2016-17 when the SMB growth tracked well over 2 std. deviations above the mean or eight months. Sooner or later the chickens are going to come home to roost for the liars at NOAA. What will likely happen is that this mass increase will be attributed to… Global warming. Warming means more precipitation, which falls as snow on the Greenland Icecap. And I could actually get behind such an explanation, the summer temperatures up there average about 10 below, so we need 10 celsius warming to melt it, meantime there is more snow. The problem is they have been and still are saying that the Greenland ice sheet is losing mass when the exact opposite is happening. That is a flat out LIE! “Rankin Inlet, Nunavut gets cold in the winter. Located on the northwestern shore of the Hudson Bay at 62 degrees and between Chesterfield Inlet and Arviat, the town is definitely in a remote yet exposed region. Weather is just a part of life and recently the weather has been colder than cold. Schools in the south get “snow days” though when you get to the 60-degree latitudes school closures are “cold days”…usually accompanied by some snow as well. When temperatures fall to -60C with the windchill or more than just about everyone will stay home and not risk going outside and expose skin. For the past few days, schools have cautiously remained closed. “I don’t remember the last time we actually closed due to weather. This is a bit of an extreme,” said Mike Osmond, chair of the Rankin Inlet District Education Authority. Temperatures are getting to –40 C before the windchill and when the winds are factored in, it feels colder than –60 C.
we just don’t get cold like we used to. now, all we get is global warming cold ‘n’ the experts say it’s getting warmer – just you wait out this ‘global warming cold’, huh then you’ll see said Noaa the idiot lap dog. They are known as ‘warming holes’ – somewhere the heat has fallen through leaving just the cold bit. Yes, I know, it is drivel but then what about climate science fiction isn’t? It is really quite shameless, 50% agenda led and 50% money led. So much so that in the two main areas of expansion Chukchi and towards Iceland, current levels are higher than they have been for some 90-95% of the last 10,000 year. But if you take the shaded areas in the graph (which I assume are “error bars”, and take points atr random within those areas (i.e. don’t assume that the actual data follows the shape given), then the arctic ice is in constant transition. For example, around 600, if the top of the error shading is right and then soon after the bottom of the error shading is right, there is a massive fall. These people don’t seem to understand their own graphs. This ugly phrase strikes one as the sort of blundering precis a not-very-bright student, who is late with his home-work assignment, makes of his incomprehensible textbook, in the twenty minutes which the school-bus takes to go from his house to the day-time scholastic prison. Data from the past which does not support the current orthodoxy was incompetently gathered or analyzed. The science is always settled; except when a still more frightening scenario can be written. Where is lovely Kate Humble in her fur-lined parka when you need her? Keeping a polar warm and well fed? Once again, more scary climate stuff but no discussion, mention nor recommendation as to what “we” can do about it. Perhaps they know the answers is NOTHING meaningful. The NOAA chart is actually not from NOAA. Is is a reproduction of Kinnard et. al. 2011 in Nature 479: 509-512. Patwalled, but the abstract suffices to show junk science. Kinnard ised circumpolar TERRESTIAL temp proxies (tree rings, lake varves) to guesstimate sea ice extent. No sea ice proxies at all. To which garbage the satellite era actual extents were incorrectly appended on a faux y axis scale. Worse than Mann’s hockey stick. A bit economic with la verite to says we have satellite data since the 70s when it is 1979 and closer to just the 80s. Donald has plenty to work on for the next 3 years and for the 4 after that. Sorry you are wrong the data started in the early 70s and used to be shown by the IPCC, but it did not tell the correct story, so they dropped the first 8 years. Go to this video by Tony Heller and look at about 7 minutes. Hemisphere sea-ice extent anomalies. Data from NOAA (USA). Did you know it came with a discussion? Especially importantly, satellite observations have been used to map sea-ice extent routinely since the early 1970s. The American Navy Joint Ice Center has produced weekly charts which have been digitised by NOAA. These data are summarized in Figure 7.20 which is based on analyses carried out on a 1° latitude x 2.5° longitude grid. Sea-ice is defined to be present when its concentration exceeds 10% (Ropelewski, 1983). Since about 1976 the areal extent of sea-ice in the Northern Hemisphere has varied about a constant climatological level but in 1972-1975 sea-ice extent was significantly less. So from IPCC, starting at a high point on the left side of the chart falsifies the slope. Joe Bastardi and the guys at Weatherbell are saying March is going to be colder and wetter than average and both the US and European models now agree. But what Joe is saying is that the weather patterns forecast for March this year are pretty much identical to those that occurred in March of 1962. In early March of 1962 the mid Atlantic states suffered the worst winter storm to hit there during that century. It was a dozy, as bad as a major hurricane strike. This was back when the atmospheric CO2 level was at 320 ppm. You know that if something like that storm hits in March (or any other time) that the ambulance chasers will be out in force AFTER THE FACT blaming it on “climate change” and so now you know that the repeat of the very conditions that led to that storm have already been forecast by legitimate meteorologists. My concern is that it’s only a short hop from propagandising to believing your own propoganda, then to outright fraud in order to maintain it, especially when you have a ‘free pass’ from the government and media. For an agency with a monopoly on data collection and presentation, who also seem comfortable publically making unsubstantiated assertions, this would seem to be more a likelihood than a possibility. The above post thread is confirmation of egregious tampering and fixing. Isn’t it convenient that all this warming is in the Arctic where there are practically no people to contradict what is claimed by the climate scientists and their media toadies?